As you know, Dad was not a man of many words, except for the occasional choice ones. Instead he was a man of motion … his communication device was his body, as evidenced by his whole life, most strongly noted these past few years as he struggled against the barriers imposed by the disease invading his mind and the increasing restrictive living challenges he faced trying to live in the very structured, contained retirement and nursing home environments. “Come on, let’s go,” was his constant mantra, even just a few weeks ago. The father I remember as a little girl was always on the go. I don’t recall memories of him sitting around, but of him swinging a hammer, pushing a lawnmower, swimming in The Snye, throwing or catching a ball with a glove or a lacrosse stick, tossing a line into the water, hoisting me on his shoulders. About the only time I remember him slowing down was when he did his country driving … going to slow on roads, I’m told he was ticketed as a safety hazard. When I moved back to Kincardine in August 2011, I discovered he was still very much a man constantly in motion. The time had come for him to not be in motion alone for his safety, so the job of chauffeur he requested of his long-time friend Orville Wilson, his daughter-in-law, Jackie, and me. Demanding as he was with his “Come on, let’s go,” we settled into a companionable routine of country driving where he would tell me about the farmers’ field, the season’s work, and the crops. During these drives, he also revealed the boy and youth he once was … by telling the stories that ultimately created the man I have grown to know. The most vivid and significant to him was the story of how his parents could not afford a bicycle for him … so when his friends bicycled to the creek a few concessions away, he would run beside them … and the man in motion has never stopped running. One day while accompanying Dad to the doctor’s office, we sat beside a man who proceeded to tell me it was not that long ago when Dad and he ran along the beach together. And in the seniors’ homes, many people expressed how they had never seen anyone go like him … fast and relentless … driven to be in motion. The other most significant memory he recited were tales about his lacrosse days … of how he would work all day framing houses and how he would be picked up to go play the game that dominated his youth. His other reminisces were his dreams of being a professional athlete … and in hindsight he thought he should have chosen baseball because it, versus lacrosse, could have meant he could have earned a living running and using his excellent hand and eye coordination talents, but still he loved his lacrosse memories. Another denied dream was his desire to sing and play guitar professionally … and in the past year he revealed the talent he did have … singing, and even making up new songs, to entertain Shirley and I as I drove them around in the car … his escape from what he considered were prisons. The farmer boy he was never outgrew his love of the outdoors … and any chance he could … all his life out the doors he would fly. As Dad’s eldest daughter, Dad was with me at the beginning of my life and me with him at the end … and as for all time in between, we were both on the go, living our separate lives, except for the time when he guided and assisted my husband Verne and I in renovating and expanding our Lakeshore Road home. Last Thursday night, the medical community finally got the right pain medicine and dosage into his weary body, the priest came … and he slept peacefully for the first time in years … and then finally he gave up being the man in motion that Friday afternoon. Though he has left us physically, so many memories and stories he gave us to tell and share, and love that he often did not how to express the depths of in his heart. What lifts my heart today is my belief he is finally free to be the man in motion God truly created him to be. Thank you for honouring him with your presence and showing us that he touched your life in some way too. On Friday, March 20, 2015, our Dad passed away after a long, arduous, and as it turns out, a very painful existence the past few years, but most notably the past months and the most painful the past week. Two services are being held … one in Kincardine Thursday, March 26, and the other is tentatively booked for Tuesday, April 7, in Wallaceburg where his many of his relatives still live and where he became famous as a lacrosse player for the Wallaceburg Red Devils … and where I lived the first sixteen years of my life. Details are on my facebook page, Kaitlin Ann Trepanier. Sorting everything out the past few days with my brother has taken most of my time, plus the recovery I needed from sleeping on a love seat in the hospital palliative room last week and waking every two hours when they woke him to give him meds and move his body position. Thanks for dropping by. I will be getting back online by the end of the week. Though I haven’t been on line for days, I know and appreciate your thoughts and prayers are with us. Dad was moved into the palliative care room in the Southampton Hospital after a doctor who had never seen him before described him as a “very, very sick man,” which until that time, no one had said because previous doctors had not investigated thoroughly his source of pain as much as they focused on medicating his aggressive (frustrated and pained) behavior revealed by Monday night’s assessment. Monday night he was put on an IV and even antibiotics till the truth sunk in and the options presented on how to proceed. Moving him into palliative care meant my commitment to be there from afternoon through till the morning when Phil arrived and stayed till early afternoon, when at first I was bringing Shirley up for the afternoon, returning her to Kincardine, and then returning for my overnight stays. Shirley’s daughter arrived home late Wednesday so now she has picked up the afternoon shift by bringing her mom and taking her home … so I can catch up on a few things … including writing this. Several of the nurses have been excellent and are helping to teach the others about palliative care, have been helpful explaining what is and will happen, and the doctors now are working with them to keep him the most comfortable. Paul and his son, Luke arrived the other night, the priest gave the Sacrament blessing late afternoon yesterday. Just two more people I expect he is waiting for, one going tonight and the other this weekend, though he saw her just weeks ago. I will miss him greatly but I had the past three and half years with him, getting to know not just my dad, but the boy, the teen, the young man. And many months ago, it was put on my heart to be with him at the end so he does not feel alone … and here I am in the same room with him fifteen to eighteen hours a day, reading to him, talking to him, keeping him calm and focused as the nurses attend to him … all is now well and soon he will have to let go because his body is saying it is time to go. The one thing I want to ask of you now is that you pray for my Dad to feel at peace with leaving this world and moving onto the next. Thank you and God bless. Dad dying … will not be returning to long-term care. He was admitted to the Southampton Hospital late yesterday after not-recovering from yet another mini-stroke. A series of tests and vitals revealed his body is shutting down. Doctor told us to call anyone last night who would want to see him before he leaves us. Stayed the night with him and his vitals have not changed much, even with the IV to stave off him dying of thirst and hunger. Heading back this afternoon with Shirley, will bring her home, and back for overnight again. Want to move him to the lovely Palliative Room, but I can’t be there twenty-four hours a day and there aren’t many other options … because we have to supply the people power to be on watch 24 hours because the room would be so far away from the nurses’ desk. Praying for the help he needs and trusting God to deliver in whatever way He knows is best. Will get back to you … sometime. We are different … ask any one who has a sibling or a parent … and expecting us to all be the same is the precursor for disaster, thankfully though, of different magnitudes. This one reason alone is the most significant reason for us … all of us … to change our thinking … the perceiving and judging that sets us apart from each other … and for some, makes them feel so rejected and so alone in their pain of rejection that they are attracted to those who are pained enough to want to inflict their pain on others. First the marginalized … the ones made to feel not right … whether in families, schools, communities, or work environments … are drawn to other marginalized people they identify with and whom they naively and falsely believe have their best interests at heart. In time, the newly marginalized realize other marginalized people cannot and will not fill the emptiness as they discover broken people can’t fill the voids and the pain they all feel. Looking for relief, they then look to the radicalized who have moved well beyond the marginalized with the intent for change … sometimes good and positive … but unfortunately, unrelenting pain often crashes with more unrelenting pain and radicalization turns dark … into revenge for people not feeling valued … respected for who they are as unique individuals and their unique beliefs that are not meant for harm, but just reflect different beliefs … and as a result, they unleash their rejection upon others … lashing out in many ways … verbal, cyber, character, and physical assaults including terrorist attacks on those, or anyone else, whom they believe prevented them from living a unique life inside the safety gates of the collective … the non-marginalized. If we want to stop abuse, violence, terrorism … we have to get to the root of what causes them … prejudice. Prejudice can be based on truth or ignorance and yet still be prejudice … the precursor that marginalizes people … and that for some … radicalizes them to inflict pain for pain … joining gangs, mobs, and terrorist groups. The answer really is much more simple than our complex world would like us to believe. Simply by “Connecting these Dots” to see the big picture and then applying “The RESPECT PRINCIPLE,” to address the details of prejudice, we can adapt and be inclusive by recognizing each person is valuable as the unique individual they are … we can begin to inhibit and one day stop the marginalization process that one, keeps people from realizing their contributive potential, and two, keeps humanity from developing past its prejudicial history that imprisons us all and limits our economic success. 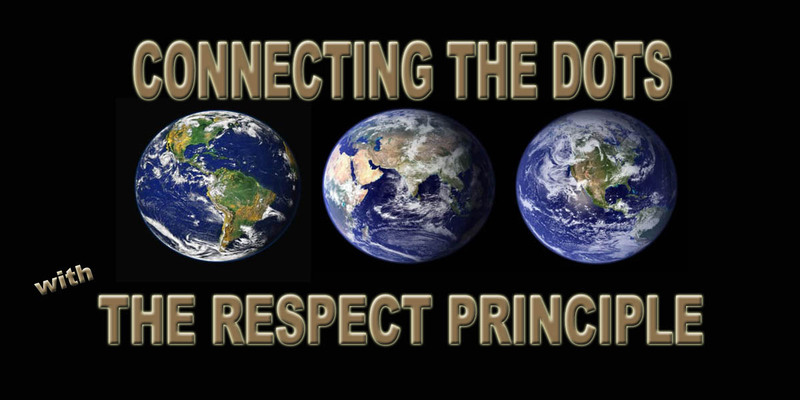 Click on the link below to DISCOVER … and SUPPORT … the INDIEGOGO crowd funding campaign for the global initiative, Connecting the Dots … with The RESPECT PRINCIPLE … because every child … every person … should know, by their own experience, they are valued … RESPECTED.